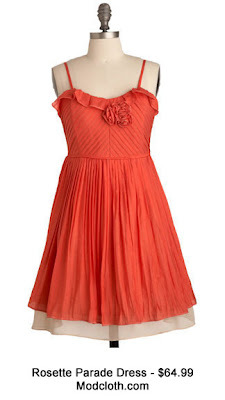 Clemson Girl: Quick Poll: Is this 'carmine red' Modcloth dress orange? Quick Poll: Is this 'carmine red' Modcloth dress orange? I saw this cute dress on Modcloth.com today - and it definitely looks orange to me...until I read Modcloth's description where they called it "carmine red". Huh? So what do you think? Is "carmine red" just a fancy way of saying orange? Or is this dress not orange? Visit Modcloth.com and see the dress. You can't trust your eyes when looking at something on the computer. You'd have to see it in person.